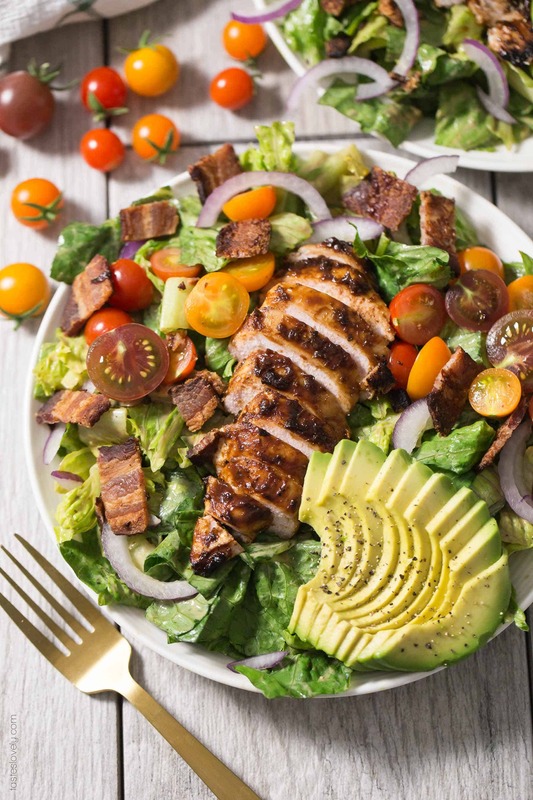 Paleo & Whole30 Grilled BBQ Chicken BLT Salad with bacon, grape tomatoes, red onions, avocado and a BBQ ranch dressing. Gluten free, dairy free, sugar free. This is the salad to make for anyone who claims they don’t love salads. Everyday around lunch time, my husband calls me to say hi and check in on what me and the toddler are up to. But I think his real motive is to find out what is for dinner. He works in construction, and he can really work up an appetite. 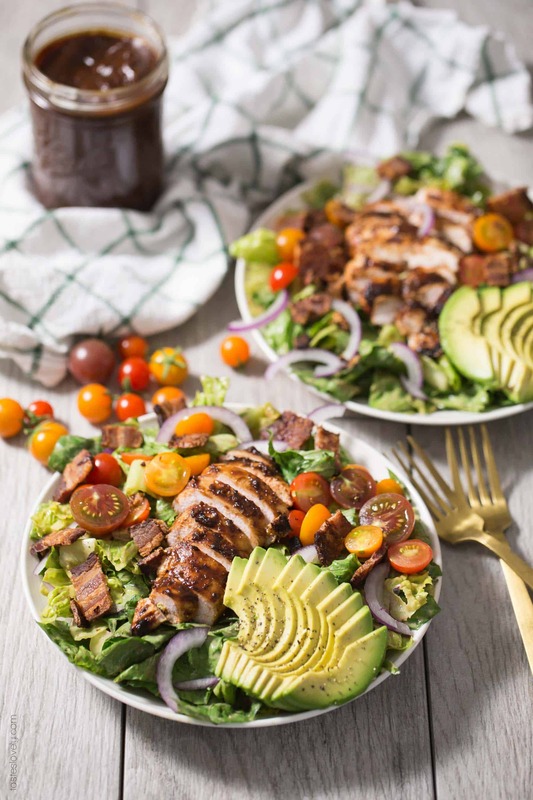 That is, until I made him this Grilled Chicken BLT Salad. Now Shawn actually gets excited when I say we’re having salad for dinner. Even better? 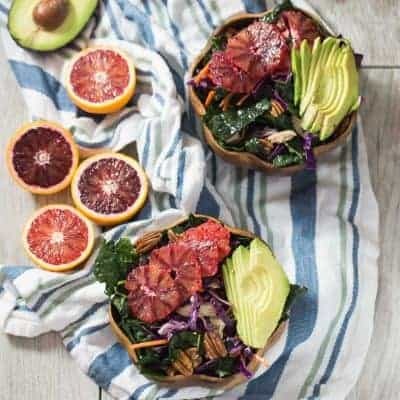 This salad is Whole30 and Paleo! So healthy! 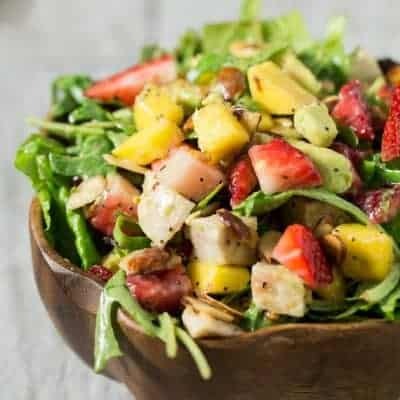 This salad has everything a hungry guy could want. Grilled chicken that has been coated in my homemade Whole30 BBQ Sauce (<– SO easy, ready in 10 minutes!). Crispy bacon. If you every want to love a salad, just add in some bacon. Sweet and juicy grape tomatoes that are finally ready to picked off our tomato plants. Some sliced red onion. And of course, avocado. I toss the romaine lettuce in a BBQ ranch dressing. I just mix some of the Whole30 BBQ sauce in to my homemade Whole30 Ranch Dressing (<– seriously the best ranch dressing I’ve ever had, swear!). 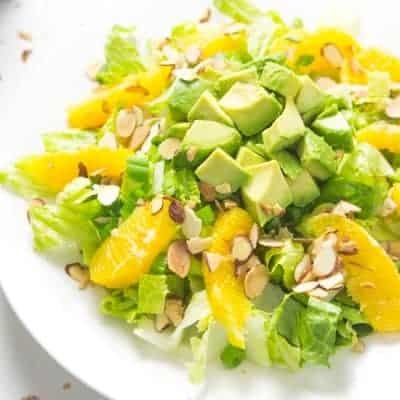 It is so tasty, and is the perfect sweet and herby dressing for this salad. The best part of this salad is that it’s so healthy! It’s Whole30 approved, paleo, gluten free, dairy free, refined sugar free. So I can enjoy this amazing and hearty salad guilt free. I haven’t been able to get the 1 year old to eat salad yet, but I’ll chop up the BBQ grilled chicken and avocado and tomatoes and bacon and he’ll eat it all up. Combine both ingredients and stir to combine. Refrigerate until ready to use. Heat your grill over high heat. Season the chicken with salt and pepper, and cover with BBQ sauce. Cook until the chicken reaches an internal temperature of 165º, about 10-15 minutes depending on the thickness of your chicken. Flip the chicken halfway through cooking. Remove the chicken from the grill, rest for 5 minutes, then slice the chicken breasts. 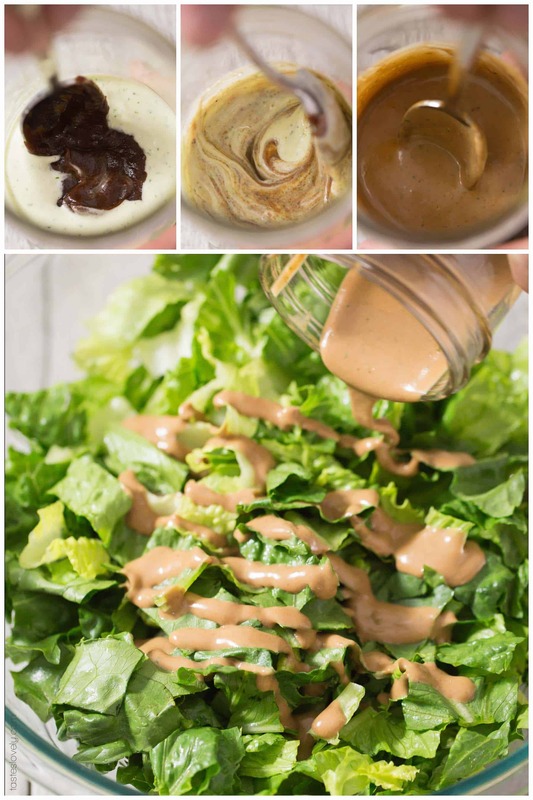 Toss the romaine lettuce with desired amount of salad dressing. Toss to coat, then transfer dressed lettuce to plates. 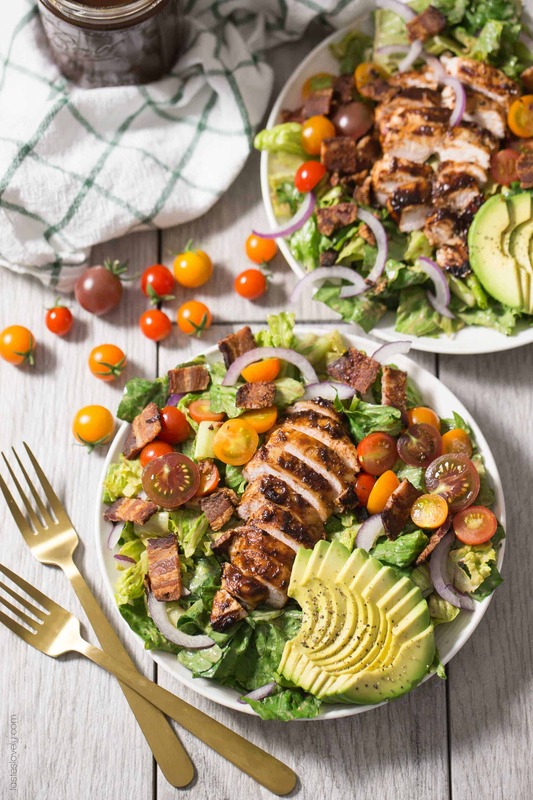 Top the lettuce with sliced BBQ chicken, chopped bacon, sliced tomatoes, avocado slices and sliced onion. If you can’t grill your chicken, just roast the BBQ sauce coated chicken breasts on a parchment paper lined baking sheet in a 425º oven until the chicken reaches an internal temperature of 165º, about 10-15 minutes depending on the thickness of your chicken.